As great as the results could be with the 5D, the shortcomings in the video mode were serious. It could only shoot in auto mode which caused the camera to change brightness in the middle of a shot, the external audio input was nearly unusable due to high noise and the frame rate was wrong, 30fps instead of the film standard of 24 or even the video standard of 29.97. But what the camera could do was so appealing, clever users started working on the problems and came up with a variety of hacks and workarounds to solve the worst of the issues. With these tricks, indie filmmakers and adventurous hobbyists started shooting truly sensational scenes and posting them online. Canon noticed that sales were skyrocketing and thousands of requests were pouring in from users begging Canon to fix a few things with the camera to make it more suitable for video and films. A few months later Canon released a downloadable patch for the camera that allowed users to disable the auto mode, improved the audio recording and let users select 24fps. The day Canon released that update, I started shopping for my 5D. I fell in love immediately. It was like shooting 16mm film from my days as a student. There were still some smaller annoyances with the camera but the big ones had been solved and it was awesome fun just shooting stuff for myself. The look of the footage was breathtaking. The great results had me spending more money buying lenses from Canon, adapters, filters, a viewfinder, shoulder rig, and much more. Over the course of two years I spent around six thousand dollars on my new “hobby” and more than four thousand of it went to Canon. I had previously been a low-end Canon customer buying the cheapest DSLRs and lenses. The 5D turned me into a cash cow for Canon. I wasn’t the only one. 5D cameras remained hard to get for over a year. Add-ons to make the 5D even better could be sold-out for months. At trade shows the booths showcasing tools and upgrades for DSLR video were packed. With the 5D, Canon launched an entire industry segment. It even had a new name “Cinemaphotography”. The fascinating thing is this was all an accident. Canon has publicly stated they never intended the 5D for this purpose. The video mode wasn’t a primary feature. It was based on a request by the Associated Press. AP wanted to have their photographers start capturing little video clips to upload online to go along with the photos AP was already licensing to newspapers. Canon thought online video clips might be a nice extra feature to sell more 5Ds to professional still photographers. That’s why the audio was crappy, the frame rate was wrong and the auto mode couldn’t be turned off. It was a brilliant mistake that created a vibrant new market. What led to this mistake? Companies typically try to maximize revenue by segmenting markets based on price and performance. 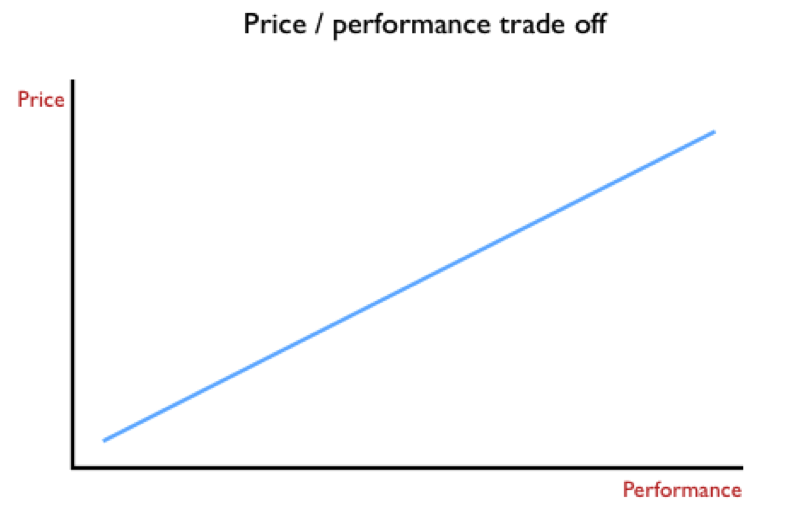 Increasing performance has a linear relationship to increasing price and shrinking market size. Pricing this way is thought to maximize revenue. Except this common view can be wrong. The Canon 5D was probably part of an orderly revenue optimization plan crafted by Canon product managers. There were cameras in the Canon product line above the 5D and cameras below it. They all fell onto a roughly linear price/performance progression, at least for all the key features Canon thought users cared about, such as megapixels, still frames taken per second and low-light performance. To Canon, the 5D’s video mode was a minor feature that might attract a few more sales. This was actually true for Canon’s traditional market of professional still photographers and serious still photo hobbyists. For those customers the 5D’s features did fit right on the straight line. However, with the video mode Canon accidentally attracted customers from another market, the market of those doing (or interested in doing) film-like video production. These new users saw the 5D mkII on a very different price/performance graph. To these users the 5D was way over to the right on performance but very low on the price axis. That’s what got so many of these new customers so very excited. The 5D enabled us to do things we never expected and did it at a price low enough to actually “create” new customers where there had seemingly been none. This is the danger of traditional market analysis. It can create the illusion of an orderly linear progression between value, price and market size. There are explosive unrealized opportunities lurking underneath these mistaken linear progressions. Smart business people can find and exploit them. I love it when one of these “accidents” happens because I like watching what the industry players do in the next generation. Do they learn from their brilliant mistake and keep forging ahead into undiscovered territory “off the line” or do they retreat back to the line for fear of not maximizing revenue? 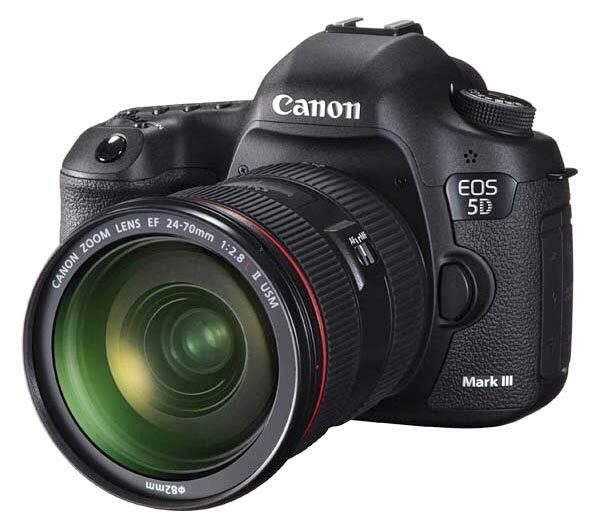 Yesterday, Canon announced the 5D Mark III and it looks more like a retreat back to the standard price/performance line than a further leap into potentially explosive new markets. It certainly seems to be a nice camera and it’s an improvement over its predecessor in many ways but the improvements are evolutionary instead of revolutionary. I was hoping the Mark III would represent as much of an improvement for video shooters over its predecessor as the Mark II was over the Mark I. I began to suspect we might be disappointed last October when Canon announced the C300 camera, a $17,000 camera targeted directly at professional small film production. The C300 camera has many of the features I was hoping to see in the next 5D but Canon has instead decided to segment the market and charge a substantial premium for those features in new model. Even though they will sell far fewer units at this higher price, Canon’s spreadsheets must say they’ll net more total revenue. Maybe that will work, but I don’t think their market projections accurately reflect the number of new users the 5D mkII “created” by leaping much farther ahead than the typical product generation. With the next generation returning to a more normal-sized step, will those customers created by the leap begin to fade back to wherever they came from? In my next upgrade cycle I think I’ll be returning to the more affordable DSLRs under $1,000. The latest versions have already gained much of the 5D mkII’s original leap through product line trickle down. To keep me, and I suspect many thousands of others, buying at the higher 5D price point, Canon needed to follow the original leap forward with another leap instead of a normal step. It’s unfortunate because I think Canon had an opportunity to keep the market expansion rolling. Many of the features in today’s cameras are not driven by hard costs such as labor and materials but rather by amortized IP costs which are relatively arbitrary. I suspect the DIGIC processing chip in the new 5D mkIII could have delivered more functionality than it does. For example, 60fps at 1080p resolution is something the $17,000 C300 can do. The new 5D mkIII delivers 60fps only at 720p resolution. It’s a step up over the mkII which couldn’t do 60fps at all but other Canon DSLRs under $1,000 have had 60fps at 720p for nearly two years. An even bolder feature would have been to give 4:2:2 color space and compressed RAW files to the 5D mkIII. That would have made the 5D mkIII as disruptive as the 5D mkII was. What Canon eventually decided to do isn’t necessarily wrong, it’s just the conservative approach. It’s safe but unlikely to yield exciting market shifts that create new customers and windfall profits. In my startups we made these kind of happy mistakes quite a bit. That’s why startups can be so exciting. They generally don’t have an existing business to protect and can’t afford expensive market research reports predicting market sizes. While interesting, these pricey research reports are often wrong because they only extrapolate the past into the future. They invariably miss showing opportunities for disruption. I found out after we launched the Snappy Video Snapshot the market research reports had said the worldwide market for video capture peripherals was only 5,000 units a year. It’s a good thing we couldn’t afford those research reports because we sold over a million Snappys.The same thing happened with Trinity and with the Video Toaster. They were hugely disruptive to the existing industry because they delivered so much value at a radically lower price. To be sure, there were trade-offs made to reach breakthrough price points but we tried to make clever trade-offs users like us would be willing to live with. Some users will accept certain shortcomings or quirks in exchange for awesome capabilities in other areas. No serious market analyst would ever have predicted the non-professional Canon 5D mkII, with all it’s workarounds and shortcomings, would be used to shoot last week’s #1 national box office motion picture “Act of Valor”. Clayton Christensen, a professor at Harvard business school, calls these users “overshot customers”. These are potential customers who don’t appear in market research because they aren’t in the market. Yet, if an acceptable mix of features are presented at the right price they’ll buy even if those features come with some severe limitations. I’m sure some at Canon think all those extra 5D customers just appeared out of nowhere. They weren’t in anyone’s survey or research report. How many other overshot customers are available to be discovered and monetized with a unique, maybe even counter-intuitive, set of features and limitations? In the early Video Toaster days, I was at an industry trade show in New York. We were attracting huge crowds with a radically priced product that had remarkable capabilities mixed with some rather arcane limitations. We were taking a lot of orders but hadn’t shipped yet. We were already starting to freak out the big players because it looked like we might disrupt their carefully modeled market and perfectly straight price/performance lines. A senior exec from Sony offered to take a few of us out to dinner after the show. It was a fun dinner and he was a nice guy full of industry info. After dinner he hired a horse drawn carriage to take all of us around central park on the way back to the hotel. During the ride he finally got to the question I think he’d been working up to all night. He asked me, “The market for video switchers and effects devices is pretty small. What happens when everyone in the market has already bought your product and there’s no one left to sell to? Won’t you have left a lot of money on the table?” I asked him how big he thought the total market was for all these products, his and all his competitors combined. He gave me a number. I smiled a bit when I told him, “We already have more pre-orders than that”. Clearly, his best market research was wildly wrong. Most research does “top down” market sizing which is basically all competitors sales combined. That’s what the research reports usually assemble either by polling manufacturers, resellers or component vendors. Even the forward-looking future predictions are created by asking the people currently buying today’s product how many they think they’ll buy in the future. The researchers might take that number and add the industry’s historical growth rate and then adjust a bit based on projections for the overall economy. Do you see what’s broken with that? Explosive growth happens when you find a way to ignite the people that aren’t buying today, who aren’t even shopping in the category today. That certainly describes me and the 5D mkII. Intel created a similar situation several years ago with a Pentium processor called the Celeron 300A. This particular Celeron chip was a relatively low-end processor but a unique and accidental combination of design and fabrication technology allowed savvy users to run the chip at a much faster clock rate than specified. The hack required some tricky modifications to enable but the speed increases were stunning. The word started spreading among hobbyists and soon some motherboard manufacturers started making motherboards that had the required modifications built in. This unleashed an explosive market expansion. The Celeron 300a was the coolest thing in the tech world. Many users were running the 300Mhz chip at 450Mhz and enjoying far higher performance for the same price. In the following generations Intel locked down some of the ways that users were overclocking the chips but often left a kind of “bonus” performance gain for savvy users willing to do a little extra tweaking and run their computer outside official specs. Intel experimented with what these users were willing to pay and whether it hurt the sales of their more expensive processors. They found that most businesses didn’t want to run their machines out of spec, even if it had no downsides. There were also non-hobbyist consumers that would just buy whatever standard PC Dell or HP had on offer. But there was a growing market of “enthusiast” users that loved tweaking their machines and making them better. This was unexpected. To their credit, Intel didn’t let this “accidental learning” go to waste. They started to cater to this market selling unlocked, overclockable processors for a bit more than the standard processors. This accidentally discovered enthusiast segment is now so significant Intel makes a class of chips just for them. It’s a lesson that Canon might do well to study before the benefits of the 5D mkII “brilliant mistake” dissipate. Great article. Describes my sentiments, and some of my purchases, exactly. I want to love the Canon 5D Mark III but can’t. They left out a number of simple, key things and jacked up the price. Bad move. What do you think of Nikon’s D800? I can’t quite get my head around a platform change, but the features on the D800 are great. Agree that Canon has gone for short-term gain – but I believe it will be long-term pain. Broadcast production, especially in the independent sector, is changing so rapidly as many public broadcasters in Europe collapse under the weight of their own manager-heavy administration and outdated workflows. I don’t think Sony, Panasonic or Canon are studying what creative documentary makers are saying, doing and publishing on Vimeo, YouTube, Daily Motion etc. That’s where the disruption is, where the creative experiments are going on with time lapse and HDR, with truly stunning material being produced. The makers know exactly how to get the best out of what they have worked hard to pay for. Great that you have been asked to do an encore presentation in Amsterdam at the end of the month. You are definitely a catalyst for change.